The Dyson AM09 looks pretty spectacular, but does it perform as well as it looks? 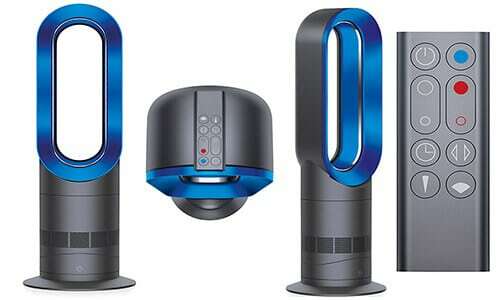 Check out our review to see if its worth splashing out on this Dyson space heater. When you are at home, you naturally want to feel as comfortable as possible. However, with the extreme changes in the weather, you need some sort of reinforcement to ensure that you will stay cool during the summer and stay warm during the colder seasons. You can buy a cooler and a heater, but why spend more when you can get both functions in just one product? Take a look at this Dyson space heater review, and get an idea of just what is possible these days. The AM09 is another show stopping product manufactured by Dyson. They are best known for designing the world’s first bagless vacuum cleaner, but they are also famous for pushing the boundaries of what is possible at every opportunity. The AM09 is no different, and while looking incredible, does things that others can’t do too. It features both a cooling fan and a heater in one which means you can maximize it and use it all year round, no matter what the weather condition is. The fan heater can heat any room quickly and evenly while the cooler can cool effectively. With two great functions, you really get what you pay for. 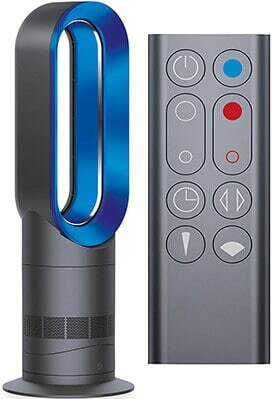 The fan heater has Jet Focus control, with the focused mode for long range powerful airflow and the diffused mode for wide projection to mix the surrounding air. It has a precise and energy efficient heating which is intelligent enough to maintain your target temperature. Once that target temperature is set, the AM09 will automatically switch itself off to conserve energy. Then, it will recurrently switch on and off to keep the your room at the target temperature. Aside from saving energy, this feature also prevents the room from overheating. It has a sleep timer so you can go to bed not worrying about it. You can just program it to turn off after preset intervals which can range from 15 minutes to 9 hours. It can be used even at night because it is designed to be 75% quieter than other models. The fan heater was engineered to reduce the turbulence significantly throughout the machine and a new aerodynamic diffuser helps in cutting down the fan noise. In fact, it has a Quiet Mark accreditation so you can still sleep peacefully and without any disturbance. The Quiet Mark is awarded by the Noise Abatement Society for improved sound quality. It stands at 23.4 inches and weighs 5.9 pounds so it can be easily transferred from one room in the house to another. Its cord length of 5.9 feet is also a nice feature as it offers flexibility in terms of positioning and placement. It has a remote control so you can change the settings conveniently to adjust the oscillation, temperature, and airflow. It even has a curved and magnetic design which is a good thing because it makes the remote easier to store and harder to lose. It is safe even for those with kids at home because there are no fast spinning blades or visible heating elements. Also, with the absence of blades and safety grills, the AM09 is very easy to clean. It has a small LED display on the base to show whether you are blowing hot or cold air, wide or narrow, and how much puff it is giving out. It is available in different color combinations to suit your taste and your house’s theme: iron and blue, white and silver, or black and nickel. The Dyson AM09 has a lot of cool and great features but aside from those mentioned above, there are still more positive things that people love about the product. 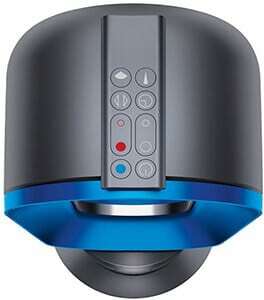 It stands out among other heaters and coolers because of its cool and futuristic design. Because of this, it is perfect for stylish homes and even offices. It is well-constructed with a sleek and premium look. Setting it up is very easy and the controls are not hard to figure out. Because of its compact design, it can be easily stored when not in use. The brush-less motor and no blade design might be the reasons why the AM09 is expensive, but it is definitely worth it. You would not want to go back to using a bladed fan once you try one without a blade. It does a great job in providing heat using both long range and diffused modes. It can work in any room, but of course, its ability and performance is also dependent on the size of the room and whether it is sufficiently closed off. Safe for kids because it does not have any blade to be worried about. The surface also does not heat up even when used as a heater. It is a bit pricey compared to other heaters and coolers with almost the same features. It does not have onboard controls so if you lose the remote, there is no way to change the settings. It would have better also if the buttons on the remote are bigger for the older users who might have a hard time figuring out what the small buttons are for. There may be a lot of coolers and heaters available now in the market that it can be a bit difficult to decide which one to buy. However, if you know the specific features that you are looking for and the cost of the item is not an issue, you can easily narrow down your list and consider just a few deserving products. After hearing all the facts about the Dyson AM09 , the question now is should you buy it? If you do not mind spending a little bit more, then the answer is a definite yes. It’s one of the most energy efficient small space heaters around, and this cannot be rivaled by similar models which are available at a lower price. Simply put, you get what you pay for. With the Dyson AM09 you are buying into a brand that has considerable experience in making quality products that last. Check back soon for more Dyson space heater reviews. The Dyson AM09 looks quite incredible, but it's not all show. It makes great use of focused and diffused air flow modes that make it one of the most energy efficient space heaters on the market. It is one of the more expensive heaters available, but it doubles up as a cooling fan for the summer months too. This isn't going to win any awards for value, but in terms of efficiency, effectiveness and looks, there aren't any better.